You can easily make your garden or backyard pop this summer and spring by installing low-voltage landscape lighting for illuminating flower beds, fences, and any other features on your landscape. Lighting up a landscape involves large and several types of lighting fixtures suitable for the outdoor environment. These lighting fixtures are weatherproof and versatile. You can use them to illuminate flower beds, fences, pathways, driveways, trees, doorways, walls, and more. You can find landscape lighting fixtures that work at the normal home voltage of 120v. For DIY installations, it is advisable to use low-voltage lighting systems that basically operate at 12 volts. Such lighting systems are safer to use, easy to install and they consume less energy. All low-voltage systems are powered through a transformer. The transformer is basically plugged into an outdoor power socket that is GFCI-protected. It works by stepping down electrical current from the regular 120 volts down to a low voltage of 12 volts. In most instances, these transformers come with a timer that works 24/7 such that you can decide the time that the outdoor lights will automatically go either on or off. Basically, transformers are categorized according to their maximum output in terms of wattage. Most models have a wattage output of 44 – 900 watts. You can determine the size of the transformer ideal for you by adding up the total wattage of lighting systems in your landscape. For instance, if you are planning to install 10 light fixtures, each rated as 18 watts, you should go for a transformer that can output 180 or more watts. This cable is specifically designed for underground cabling in a landscape. The cable is connected from the system’s transformer to all lighting fixtures installed on the landscape. The cable typically comes in 12 or 14 or 16 gauges. A lower gauge number translates to thicker wire and greater capacity. The power cable you will need will mainly depend on the cabling length you need and the transformer size. For instance, a transformer rated as 300 watts can be used for powering a 16-gauge power cable measuring 100 feet or a 14-gauge power cable measuring 150 feet, or a 12-gauge power cable measuring 200 feet. Always check from the manufacturer when determining the ideal size of a power cable for your lighting system. Pathway lights are specially designed for lighting driveways and walkways. This fixture is one of the most elegant and stylish landscape lighting. Plated-metal or shiny copper fixtures in these lights stand out the most while brown, green or black colours tend to blend well in outdoor surroundings. Accent lights are great for any kind of landscape lighting systems. They are more of specialty fixture that is mostly hidden from the view of passersby. They include up lights, spotlighted, wall-wash, and floodlights fixtures. These fixtures are usually used for shining some light in flower beds, walls, trees, ponds, fences, shrubs or any other landscape feature. The first step is laying the power cable. Basically, you should start with laying the lighting systems on the spots you are intending to have them installed. Ensure you space the lighting fixtures 8-10 feet between each other. Once done, unroll the power cable and then lay it beside the light fixtures. In case you come across an obstacle, say a fence, tree or boulder, roll the cable around or under the obstacle. Get a square-bladed shovel and use it to make a 2-3 inches deep trench extending along the stretch you will be installing the lighting fixtures. As you make the trench, try to make it straight as much as you can, but it’s not a must to make it perfectly straight. Thus, us you happen to hit a root one rock, just dig around it. Also, you will not have to remove dirt or debris as you make the trench. Just dig normally while making a V-shaped, deep trench. Now set the power cable along the trench while pushing it down to ensure it settles at the bottom of the trench. You can push it using narrow 0.5 inch plywood. Avoid using a shovel or any other tools to push the cable as such tools can easily slice the cable and cause a short circuit. A low-voltage electric cable comes with two insulated copper wires tied together. All you will need to do is to peel the wires apart to get 4 inches of free wire. Use a wire stripper to remove around 5/8 inches of the insulated wire from both sides. Once done, slide both wires into a retaining strap at the back side of the power transformer. Insert one of the wires into the screw terminal labeled A and the second wire into the B terminal. Tighten both screws to ensure that the wires are well secured. Upon securing the wires into the transformer, drive a 2 by 6 pressure treated stake down the ground right next to the outdoor power outlet. Next, attach the electric transformer onto the stake using stainless-steel or galvanized screws. Use insulated staples to secure the power cable onto the stake. You may now start connecting all the lights. First, attach a cover on the outdoor power outlet to protect it from snow and rain while still allowing easy access. Next, plug the power cord of the transformer into the outdoor power socket. Connect each and every lighting fixture onto the electric cable. Most lighting fixtures for landscapes are usually prewired with snap-on and user-friendly connectors. You will simply pinch each connector into the power cable. The connectors have sharp prongs that pierce easily into the cable to make good contact with both wires inside the cable. Now that you have already connected the transformer into a power outlet, the light fixture you just attached will light up. In case it doesn’t, try pulling out the specific connector and reconnect or check whether the light bulb is attached properly. Once everything is functioning properly, lift the lighting fixture and put it in a standing position. Push the pointed stake into the soil and ensure it is deep, straight and firm enough. Push it in carefully to avoid hitting the buried electric cable. Repeat this procedure on all other light fixtures one by one. Upon installing all the light fixtures, fill the trench using top soil. You can top up the soil with some grass seeds. 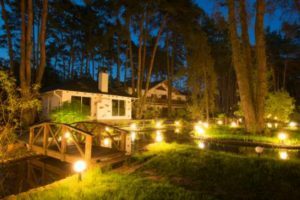 The post How to Install Low-Voltage Lighting in Your Landscape appeared first on Castle Hill Electrician Pros.